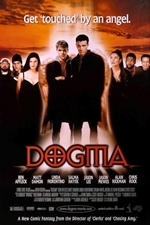 Dogma is a 1999 American comedy film, written and directed by Kevin Smith, who also stars along with Ben Affleck, Matt Damon, Linda Fiorentino, Alan Rickman, Bud Cort, Salma Hayek, Chris Rock, Jason Lee, George Carlin, Janeane Garofalo, Alanis Morissette, and Jason Mewes. It is the fourth film in Smith's View Askewniverse series. Brian O'Halloran and Jeff Anderson, stars of the first Askewniverse film Clerks, have cameo roles, as do Smith regulars Scott Mosier, Dwight Ewell, Walt Flanagan, and Bryan Johnson. The film's irreverent treatment of Catholicism and the Roman Catholic Church triggered considerable controversy, even before its opening. The Catholic League denounced it as "blasphemy". Organized protests delayed its release in many countries and led to at least two death threats against Smith. The plot revolves around two fallen angels who plan to employ an alleged loophole in Catholic dogma to return to Heaven, after being cast out by God; but as existence is founded on the principle that God is infallible, their success would prove God wrong and thus undo all creation. The last scion and two prophets are sent by the Voice of God to stop them.